So you have the big day all planned out or perhaps it is an important birthday party for your oldest child, or maybe it is a fundraiser for a local charity, it might even be a graduation party. Whatever the occasion is, there is one extra thing that will just make your day that much more amazing and awesome. View our LED Dance Floor here. If you have never heard of an LED dance floor before, you are about to be surprised. It is one of the best bits of digital technology you can find in the world. If you are at any celebration, you and your guests will want to celebrate in the best way and often that will include dancing, but who wants to dance on any old floor or carpet? With LED dance floors, you can jazz up the dancing by flashing lights in many different patterns and designs, it can also display pictures, text and whatever your imagination dreams off. It doesn’t matter what kind of theme your party or event is, this digital LED dance floor can perfectly transform to fit the occasion. Imagine dancing upon a twinkling starry night with your new husband at your wedding reception. Nothing could be more fitting to help you get lost in the moment. Or imagine a children’s birthday party where Mickey Mouse paid a visit on the dance floor. You can choose any design for your LED dance floor and not only this, but you can choose the speed as well. You can pick a gentle, slowly moving array of flowers, or a bold speedy colour flashing that really makes you want to move. You can literally choose anything you want for your dance floor. Text is another important feature that you can use to your advantage. Whether you want to make an announcement or even advertise yourself, LED dance floors can allow you to display any amount of text. You can choose the font, the colour, its scrolling direction and of course the speed. Now, you might be wondering how in the world you control your LED dance floor and how it is installed. For starters, you can have your dance floor installed at any location you desire. It is wirelessly operated and fully addressable. Not only this, but it is also highly portable and very little time is needed for installation. 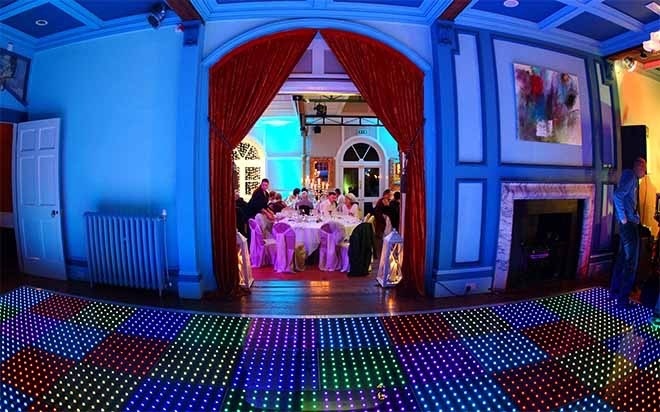 So you no longer have to be stressed out about the time consuming efforts to install your LED dance floor. Professionals can be in and out of there in very little time. Not only this, but should you need to move your dance floor from one location to another it can be done for you at any time. Who wouldn’t want to make their special event the very best it could possibly be? Anyone can have a dance at an event, but everyone knows you first dance has to get people onto the dance floor. You are sure to impress your guests with our new LED dance floor. So don’t wait around to get it! Have an awesome party!